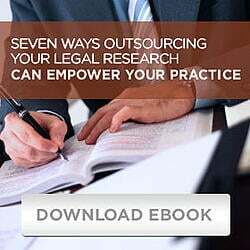 Legal Research Updates & Information - NLRG Blog | National Legal Research Group, Inc.
EMPLOYMENT LAW: When Can an Employer Require an Employee to Undergo a Medical Exam Under the ADA? BUSINESS LAW: Is Predictive Dialer an Autodialer Subject to the Telephone Consumer Protection Act? PROPERTY: Do Short-Term Vacation Rentals Violate Covenant Prohibiting Commercial Activity or Use? TORTS: Is Your Computer Tracking You? PROPERTY/LANDLORD TENANT: Can a Tenant Use the Exclusionary Rule When Fighting an Eviction? CRIMINAL LAW: Was Traffic Stop Unlawfully Prolonged in Violation of Rodriguez? EMPLOYMENT LAW: Are Gay, Lesbian, and Bisexual Employees Protected from Discrimination Under Title VII? MARITIME LAW: Is Consumption of Fuel Stores During a Hijacking Event Covered by General Average? EMPLOYMENT LAW: NLRB "Search-for-Work" and "Interim Employment"
CIVIL RIGHTS: Pregnancy Discrimination Under PDA: Supreme Court's Interpretation of Same-Treatment Clause in Young v. United Parcel Service, Inc.
PRODUCTS LIABILITY: What Statute of Limitations Governs Breach-of-Warranty Claims for Personal Injury? CIVIL RIGHTS: Do Termination Reports Constitute "Publication"? FAMILY LAW: Did Actions of Alleged Father in Response to Custody Petition Amount to Consent to Court's Exercise of Personal Jurisdiction? ESTATES: Assets—Gold Bars, Bullion, and Coins—Tangible or Intangible Property? PROPERTY: Does Seller of Real Property Have Duty to Disclose That Property Is Haunted? PERSONAL INJURY: Does Medical Monitoring in Absence of Present Physical Injury Merit Award of Damages? PROPERTY: Is an Oil and Gas Lease Subject to the Implied Covenant of Good Faith? CORPORATIONS: Does the Business Judgment Rule Apply to Corporate Officers? PENSIONS: What Severance Contracts Are Subject to Federal ERISA Law? CRIMINAL LAW: Driving Under the Influence of a Proscribed Drug or "Its Metabolite"
FAMILY LAW: Is DOMA § 2 Next? CIVIL RIGHTS: Does Title VII Permit Claims Against Supervisory Individuals in Their Official Capacities? TAX: Representing the "Innocent Spouse"
CIVIL RIGHTS: The EEOC's Presuit Conciliation Obligation—When Is It Satisfied? PROPERTY LAW UPDATE: A Brief Synopsis of RESPA's "Qualified Written Request"
CONTRACTS: "Plain Language" Versus "Legalese"
TAX LAW UPDATE: Codification of the "Economic Substance Doctrine"
FAMILY LAW UPDATE: Transfers for Grossly Inadequate Consideration: Gift or Sale? PERSONAL INJURY & INSURANCE LAW UPDATE: Umbrella Liability Policies—Must They Provide UM/UIM Coverage? CIVIL PROCEDURE: When Is a Procedural Rule "Jurisdictional"? HEALTH LAW: Patient Privacy Interests: At Odds with Medical Advancement? CONSTITUTIONAL LAW: The Difference Between "Legislative Prayer" and "School Prayer"
PROPERTY: Adverse Possession—Assertion of a "Claim of Right"
PROPERTY LAW: What Constitutes Unearned Fees Charged to Borrowers Under RESPA § 8(b)? PRODUCTS LIABILITY: Is the Statute of Limitations in Individual Products Liability Actions Equitably Tolled During the Pendency of a Class Action in Another Jurisdiction? CRIMINAL LAW: Search and Seizure—Warrantless Use of GPS Device on Defendant's Vehicle Found to Be a "Search"
BANKRUPTCY: Student Loans: When Is the Debt Dischargeable? CIVIL PROCEDURE: Is Denial of Summary Judgment Appealable After Trial on the Merits? EMINENT DOMAIN: What's an Easement Worth?